And yet, I don't think I know what cold really is. I mean come on, I've spent my whole life in Australia. I've never even seen snow. I think I'm a passing expert on heat, but cold? I'll defer to the crew of the ill-fated Terror on that one. Spare a thought for these guys. They sailed off in an attempt to find the north west passage fully expecting, and this is the part that blows my mind, they fully expected to be stuck in ice for years of end. Stuck. In ice. For years. The ocean they were sailing through literally starts to freeze and instead of freaking out they're all, 'yup, that's about right.' It wasn't an unpleasant surprise, it was part of the game plan! Are you kidding me? And that's not even fiction! 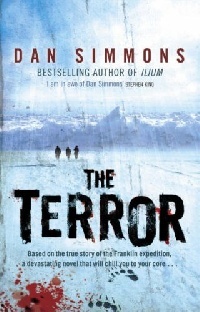 Dan Simmons' 'The Terror' has its roots in true events. There have existed men who were willing to set out on an expedition fully knowing that they were going to BE TRAPPED IN ICE FOR YEARS AND YEARS WHAT IS THIS I DON'T EVEN? To me, being ice bound for months with the same men for company and dwindling food supplies would supply enough horror for one book. And Simmons certainly goes to town with it. The pages of The Terror just reek of desperation and boredom and that brittleness that comes from constantly being on the edge of hysteria. And the cold... Reading this book will put a chill in your bones, Simmons captures the oppressive cold so well. Can you just picture it? Standing on the deck of a ship trapped in ice, your viability is shot, everything is white and cold and you hear a rustle. The wind? Or the ice monster come to eat you? Having read The Terror I can picture this. I can picture it all too well, because Simmons captures the atmosphere of it all perfectly. The ice monster terrified me. And all the more so because Simmons creates such engaging characters that I really didn't want to see them get eaten. (Well, most of them). Crozier in particular was fantastically done. A deeply flawed man who nevertheless has to hold everything together, even though he knows he's not really up to the job. As anyone who's ever read a zombie book already knows, the real monster always turns out to be man. And as The Terror progresses and things go from worse to worser, this becomes all too clear. The ice monster is a thing to inspire terror, but it doesn't even come close to the evils men are capable of. We may never know what happened to the crews of the real Terror and Erebus, but I hope for their sakes that is was a nicer fate than the one Simmons dreamed up for them. Wow, I totally stumbled across this book years ago and always wanted to read it... This will be a purchase for me. I have to say that I am writing a story of my own that closely resembles the themes in this book. I'm in the navy and I have always been fascinated by the idea of men being trapped on a ship. Whispers of Mutiny aplenty I imagine! Great review, and thanks for the recommendation! I'm not a big fan of the science-fiction/fantasy genres. What I am a fan of, actually, is Dan Simmons. He is the only author who can constantly hop genres all the while remaining fresh and appealing to all of his fans.